As you know, we’ve been exploring how Google Plus and Hangouts are allowing fans and bands to connect in new and intimate ways to revolutionize the virtual concert experience. 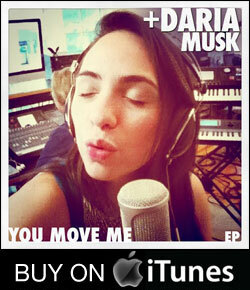 Now, we’d like to share with you a very interesting story we’ve been following about singer-songwriter Daria Musk who’s been using her Google Plus page and marathon Hangout Concerts to “change her life” and quickly become a rising star on the web. As you can see by the fan map above and the snippet from Musk’s post about How Google Plus changed her life, the new social network, and it’s ability to create an instant virtual community of live music fans, is completely changing what a concert is, how it’s experienced online, and how the shared experience of a concert can spread virally across the world. As night turned to day for viewers in Europe, evening into the wee hours of the morning for me, and morning shifted to afternoon in Australia… I kept playing to see as many of their beautiful faces as I could. We played for 7.5 hours straight. We played for guys in Sweden, ladies in London, a girl in the Dominican Republic, people in Argentina and Ghana and a mother and son in China. A hospital in Portugal fed the live-stream of the concert onto the screens in their ER room to cheer up patients and nurses. I saw little girls dance to my music on an Australian Sunday morning when it was Saturday night for me. I watched the sunrise in Norway through a new fan’s screen while I played my song called “Foreign Cities”. It was the most beautiful thing I’d ever seen. Musk is a very savvy musician and she’s released the Hangout Concerts online. And I had the pleasure of watching her ask fans what the Hangout Concert album should be called and it wad great to see the community rally around her and most importantly see her connect and interact with her fans directly. What’s also interesting about Musk’s story is that it’s very similar to how Kate Diaz, another singer-songwriter who has successfully used YouTube to showcase her songwriting skills, develop her talent and get gigs playing with K’NAAN. Here’s a long list of other artists and musicians who are using Google Plus to connect with fans. The fan engagement level and style varies for all of them. For example, I didn’t see a whole lot of Hangout’s or two-way dialogue from Madonna, Snoop Dogg or Britney Spears, just a lot of the standard tour updates, slice-of-life posts and promotional stuff. But my personal favorites on the list are Blink 182’s Mark Hoppus, and Fallout Boy’s Pete Wentz all of whom have hosted several hangouts with fans. We’ll continue to follow Musk’s story we’d like to hear what you think about artist using Google Plus to re-invent the meaning of live music. What artists have you enjoyed connecting with and following? Let us know and share your thoughts in the comments below and we’ll include them in a future episode of Live Fix Radio. We’re also putting together our first Concert Fan Hangout, so connect with us on the Live Fix Google Plus page.